Cheers to starting of a New Year and to the zealous moments that made 2018 beautiful. 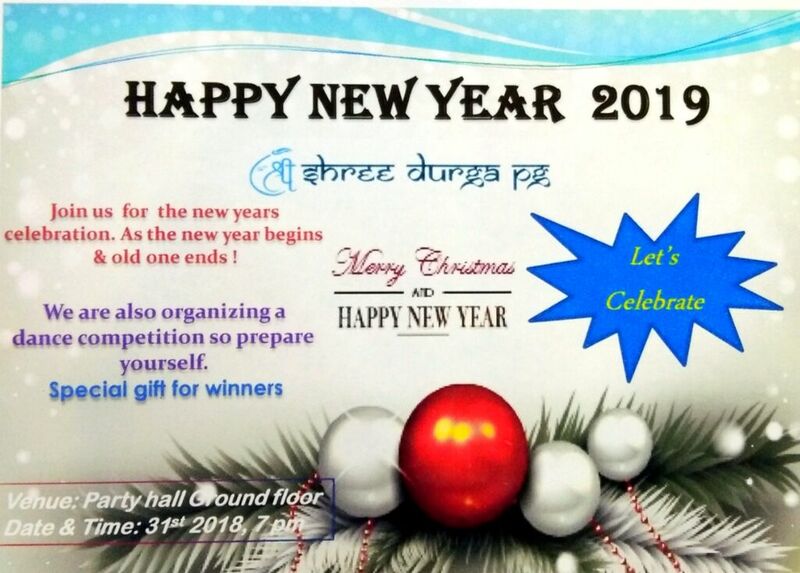 Shree Durga PG For Girls is celebrating the time that lies between the end and the beginning of the two different years. The girls residing in our Girls PG In Laxmi Nagar haven’t booked tickets to return home to spend this New Year because they all are excited to be a part of an unforgettable celebration that is going to held in the party hall of the PG. The Dance Battle – Put on your dancing shoes and be prepared to burn up the dance floor with your groovy moves as we have organised a dance competition that aims at sharing a positive level of competency between the girls. It would also help in getting entertained and spending the night with a happy feeling. Doling Out Prizes – We know how to make happy people feel lucky and thus, we would be handling the prizes to the winners of the competition. Impressing The Foodies – The food served in our Women PG In Laxmi Nagar will treat your taste buds for sure. To enjoy all this, reach at 7 pm sharp to the party hall. Contact us to know us better and to book a room in our PG.